We honeymooned in Rome. Just four days. We visited the Colosseum, the fountains and steps, and explored ornate basilicas. We ate mountains of pasta and pizza in gorgeous cafes and restaurants. We caught a good long look at Brad Pitt filming Oceans Twelve. And, of course, we visited the Vatican. The Vatican was a highlight for me, but kinda bizarre at the same time. We waiting in a queue that snaked in the street around the building for an hour or so, then a large crowd of tourists as good as carried us through one of the most opulent places on the planet. Visiting the Vatican is a feast for the eyes, but not necessarily for the soul. I found that everywhere I looked there were too many stunning priceless artefacts on display to take in; my eyes didn’t have a chance to rest on one before I was swept along by the crowd to the next amazing room. 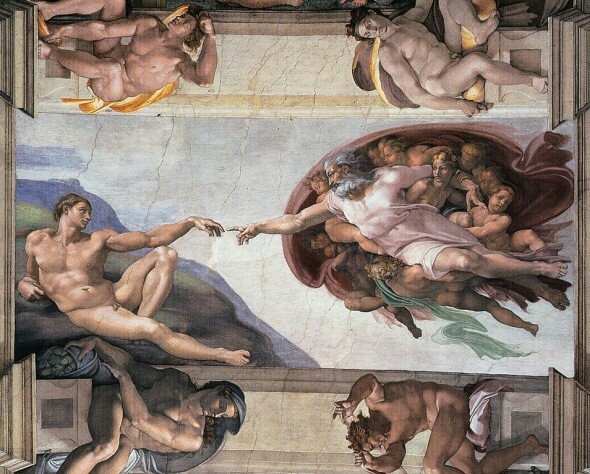 The Sistine Chapel is a crowded, silent, beautiful place. I remember standing breathless in the middle of it staring up at the image of Michelangelo’s Creation of David, not quite believing I was actually there and I was finally looking up at it. The place was packed, standing room only, but you could have heard a pin drop. It was just so hard to understand that the Vatican is a holy place. All this wealth so extravagantly displayed, when there’s so much poverty going down, so many in need. It felt like one of the most un-Christian places I’ve ever visited. I know expressing that irony is a cliche, but really, something is very wrong about the Vatican.